Last night Snodland traveled to Tunbridge Wells for our first En Passant match of the 2014/15 season. We came away with an excellent win, remaining unbeaten in the process! This entry was posted in En Passant and tagged 2014/15, David Fowler, David Lettington, En Passant, George Hollands, Matt Gazes, Peter Hickey, Robert Thompson, Tunbridge Wells on 10/14/2014 by georgehollands. The following results are available from rounds 1 & 2 of the qualifying phase. There’s still some places in the new look, double round A-League available to fight for. 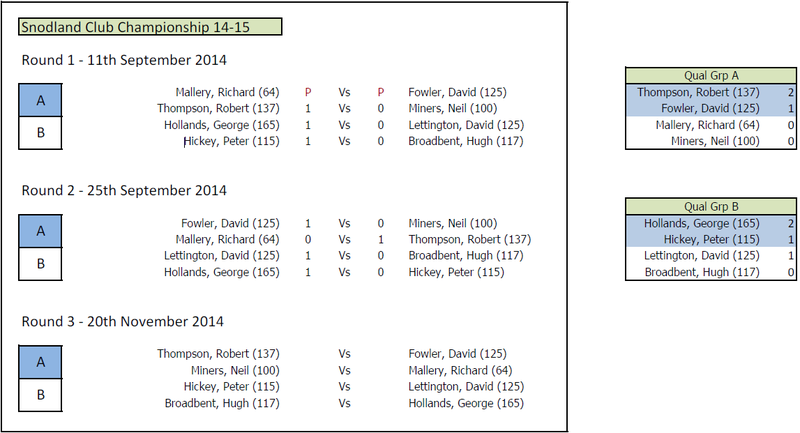 This entry was posted in Club Championship and tagged Club Championship, David Fowler, David Lettington, George Hollands, Hugh Broadbent, Neil Miners, Peter Hickey, Richard Mallery, Robert Thompson on 10/08/2014 by georgehollands. Ok, so my previous post has been up for a while, I hope you all took the time to try and calculate like you would in a real game! I suspect if that was the case, you would just recapture on c3 and allow the arrow of time to take it’s course……. (This is what happened in the game, so don’t feel too disappointed if that was your choice, you just drew with a GM). However, this is an excellent example of why we should always be alert and not just assume we should recapture. We all need to be concrete in our analysis and not be afraid of ghosts. See the solution here and see how much looks familiar. Perhaps you had other ideas not mentioned in the solution (there are many lines further in that all win)? This entry was posted in Brain Crushers and tagged Brain Crusher, Gagunashvili, Tactics, Zhang Zhong on 07/01/2014 by georgehollands. In a new series of posts I will present a position for the more ambitious player to solve. Below we have the game Gagunashvili – Zhang Zhong, Jakarta 2011. 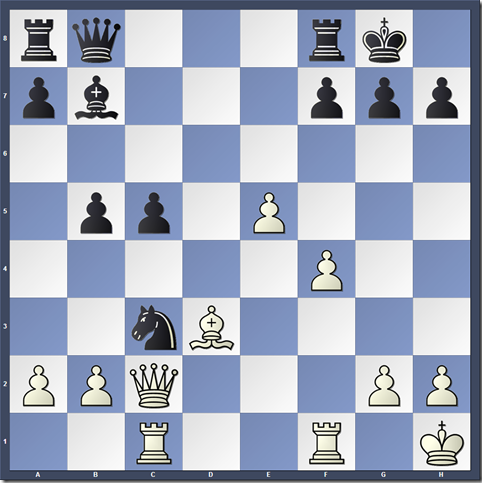 Black has just played 19…Nxc3 – How do you proceed as White? This entry was posted in Brain Crushers and tagged Brain Crusher, Gagunashvili, Tactics, Zhang Zhong on 06/22/2014 by georgehollands. This entry was posted in Presentation Evening and tagged A-League, B-League, Challenge Cup, George Hollands, GOTY, Hugh Broadbent, Neil Miners, Peter Hickey, Presentation Evening, Richard Mallery, Robert Thompson, Tom Fuller on 06/22/2014 by georgehollands. This entry was posted in Top Player Watch and tagged Carlsen on 04/23/2014 by georgehollands. This entry was posted in Quotes on 04/16/2014 by georgehollands. This entry was posted in Club Championship and tagged Club Championship, David Fowler, George Hollands, Hugh Broadbent, Jerry Pol, Neil Miners, Peter Hickey, Richard Mallery, Robert Thompson on 03/16/2014 by georgehollands. This entry was posted in Club Championship and tagged Club Championship, David Fowler, George Hollands, Hugh Broadbent, Jerry Pol, Neil Miners, Peter Hickey, Richard Mallery, Robert Thompson on 03/12/2014 by georgehollands.